I have a complicated house. It’s a dual-split level; think of it as a house sawed in half, with one-half sunk into the ground. That half constitutes the daylight basement which houses my office. My office is also home to the Comcast Business gateway and my Netgear Nighthawk X6 wireless router. The physical distance between the router and the furthest corner of the house is probably about 50 feet, up two floors in my bedroom. Despite the short distance, I get weak WiFi reception in the bedroom. So I finally caved in and picked up a dedicated access point. Bowing to the groupthink of the Improbable Insights Podcast crew (David Bryand and Eric Klein), I ordered up an Ubiquiti Unifi AC Pro access point. The access point required a little setup using Ubiquiti’s own software. The biggest annoyance occurred when the software required me to install Java. Really, in this day and age, relying on Java seems quaint and anachronistic. Given my relatively fixed configuration, though, I figured I only needed to set up the AP once, so promptly uninstalled Java after the installation completed. That said, setup turned out to be much easier than trying to configure a consumer router as an access point (Asus routers excluded, since they have a neat one-button AP configuration setting). Another minor quirk is how the AP gets power. Instead of a power brick or built-in power supply, the AC Pro uses power-over-Ethernet (PoE). Neither my router nor my 24-port gigabit switch supplies PoE. Ubiquiti did ship a PoE adapter, which works well enough, but required both a wall power connector and two Ethernet cables. Ubiquiti targets small business and enterprise networks, so requirements such as PoE is no surprise, but you should be forewarned if you’re installing their gear into a home. Once installed, the AP works great. I get pretty a pretty solid connection throughout most of my home, to the point where I rarely connect to the Netgear router any longer. The Unifi sits on a bookshelf in one of our bedrooms, looking more like a weird piece of high-tech art than an access point. 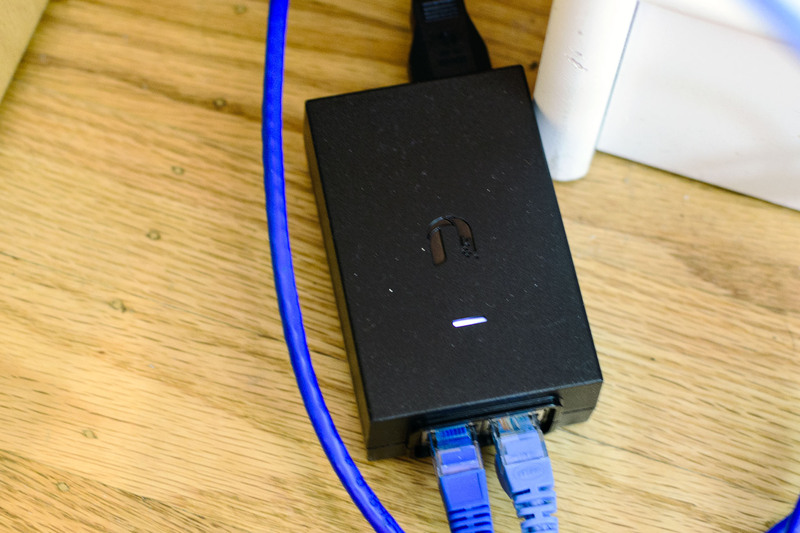 Overall, the Unifi AC Pro gets a big thumbs up from me.